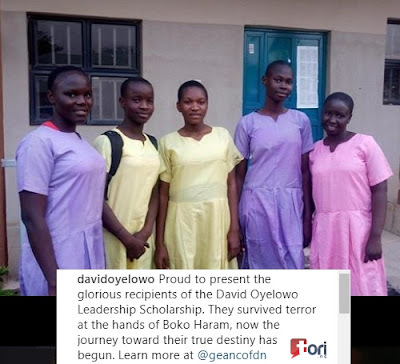 “Proud to present the glorious recipients of the David Oyelowo Leadership Scholarship; they survived terror at the hands of Boko Haram, now the journey toward their true destiny has begun." Speaking further on the essence of the scholarship, Oyelowo said, “We cannot stand idly by while thousands of innocent girls remain under serious threat. “With our help, these bright and resilient girls can blossom into Nigeria’s most inspiring leaders in government, education, business, entertainment, and so much more. “That is what these Leadership scholarships are all about. We seek to nurture a generation of strong female trailblazers whose positive impact will be felt across Nigeria and around the world”. The actor said he made the donation under the auspices of David Oyelowo Leadership Scholarship in conjunction with the GEANCO Foundation which donates critical supplies to schools in Nigeria. The Hollywood actor’s scholarship scheme is aimed at providing life-changing scholarships to young female victims of terrorism and gender inequality. Oyelowo plays an active role in selecting its recipients and raising money to ensure its continued success. Oyelowo recently starred as ‘Harold Soyinka’ in soon-to-be-released action comedy film ‘Gringo’.